Laser Hair Removal: Come and Get It While It’s Cold Outside! With so many hair removal techniques now available, it’s sometimes challenging to discern the difference between them. In this blog, we’ll profile laser hair removal, explaining why the treatment is so popular, which parts of the body benefit from the procedure, and why you should consider undergoing laser hair removal in winter. Laser hair removal ranked among the top 5 non-invasive procedures in the U.S. in 2017, with more than one million candidates enjoying the benefits of silky smooth, low- maintenance, hair-free skin. In one study, 71% of participants stated that they were satisfied with their results following treatment. Laser hair removal has radically evolved over the past decade to offer ever-improving results to a more diverse range of candidates. When the technology was first released, it was suitable only for individuals with dark hair and fair skin. Nowadays, individuals of almost all skin and hair tones can benefit from undergoing laser. Laser devices with shorter wavelengths can remove the hair of those with lighter complexions, while longer wavelengths can more effectively remove hair from those with darker complexions. One thing that is important to note: laser will not permanently remove your unwanted hair, but it will permanently reduce the growth of hair in the targeted area. Where can laser hair removal be performed? More contained areas such as the bikini line or upper lip can be treated within mere minutes, while larger surface areas such as the back may take around an hour. The laser device emits heated concentrated beams of light to target the hair follicles, which are responsible for producing new strands of hair. The laser passes through the skin, along the hair shaft, and is converted into heat at the follicle. The heat of the laser damages the follicle, inhibiting new hair growth. The laser beam is attracted to the melanin pigment in the hair shaft, so the darker the hair, the more successful the laser treatment is likely to be. Other methods of hair removal such as tweezing, shaving and waxing, remove hair above the surface of the skin, leaving the follicle untouched. Laser hair removal harmlessly bypasses the skin to reach directly into the root of the hair. Exogen: shedding of the hair. For laser hair removal to be effective, the hair must be targeted during the anagen stage of growth while it has a strong connection to the papilla, which is fed by blood vessels. In later stages, the hair is already beginning to detach from the root, so the laser is not as likely to damage the follicle. 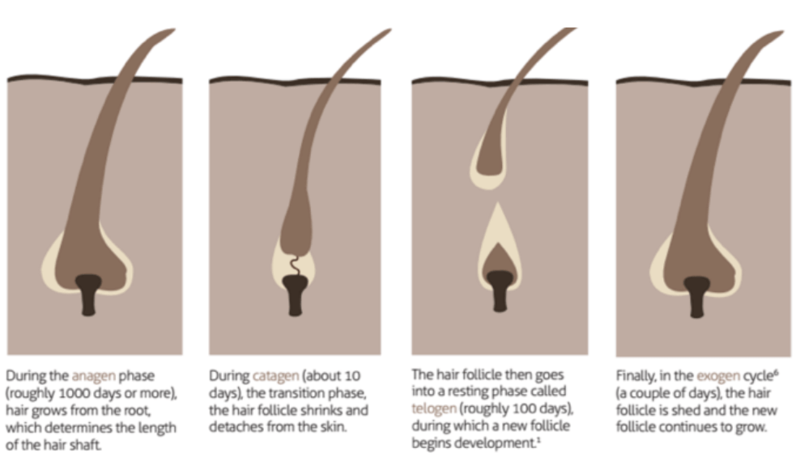 Hairs in the treated area will be at different stages of the growth cycle during the laser hair removal procedure. Because laser can only successfully damage the follicles of hair in the anagen phase, more than one treatment is needed. Most individuals benefit from two to six treatments, spaced six weeks apart, and can expect up to an 80% reduction in hair after six treatments. Occasional maintenance treatments ensure you keep your gorgeous results. Why should you start laser hair removal in winter? The cold, dark, depths of winter (yes, that’s January, February, and March) is the ideal time to head into the medspa to get your body de-fuzzed for the long, luscious, skin-baring days of summer. Why? Pale, winter skin is perfect for laser hair removal. If you have tanned skin, the setting on the laser device generally needs to be reduced, making it less effective. Basically, the paler you are, the higher the likelihood of enjoying excellent results. Following laser hair removal treatment, you need to stay out of the sun. Your skin will be photosensitive following the procedure and needs time to heal. As you’re less likely to bare your skin in winter, it’s much easier to keep it undercover and protected. If you start your laser hair removal journey in winter, then you are more likely to enjoy smoother, hair-free skin when summer rolls around. Most people experience their greatest results following their first session of laser ( expect a 10-25% reduction of hair according the the American Association of Dermatology), with an average of 20% hair loss following each session thereafter.